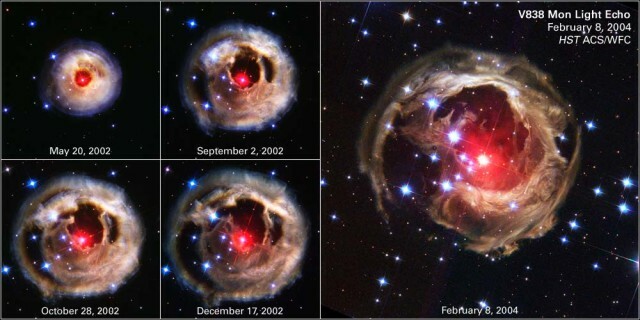 V838 Monocerotis is a red variable star also known as Nova Monocerotis 2002, located in the constellation Monoceros. The star lies at a distance of around 20,000 light years from Earth. It became famous in 2002, when it had a major outburst and briefly became one of the largest stars known and one of the most luminous stars in the Milky Way, with a luminosity about 600,000 times that of the Sun. What made the star famous when the first Hubble images arrived was the phenomenon known as light echo, an optical analogue to the sound echo, typically produced by rapidly brightening objects like supernovae and novae. Most stellar outbursts are caused by nova or supernova explosions. A nova is a thermonuclear explosion that occurs when a white dwarf accumulates too much material from a binary companion. It doesn’t result in the destruction of the star. A supernova, on the other hand, occurs either if a white dwarf explodes after accumulating too much fuel from a companion or if a star runs out of fuel at its core, collapses into a dense object, and then explodes outward. 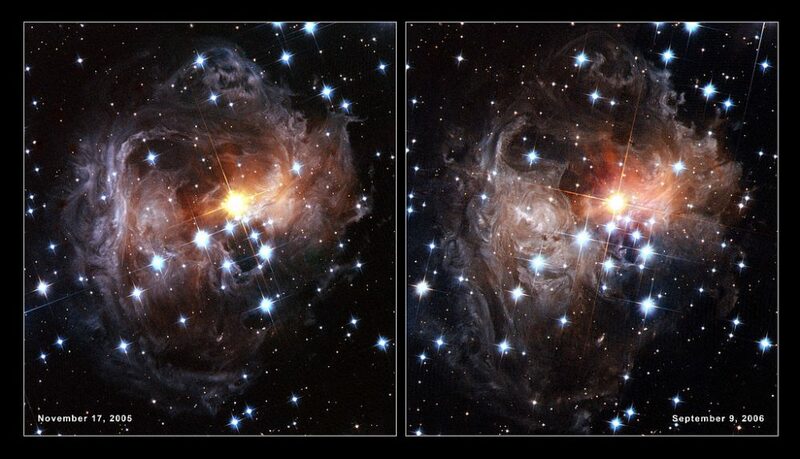 The shells of dust visible around V838 Monocerotis are not the result of the star expelling matter, but of circumstellar dust being illuminated by the star’s light echo. In January 2002, a dull star in an obscure constellation suddenly became 600,000 times more luminous than our Sun, temporarily making it the brightest star in our Milky Way galaxy. The mysterious star, called V838 Monocerotis, has long since faded back to obscurity. But observations by NASA’s Hubble Space Telescope of a phenomenon called a “light echo” around the star have uncovered remarkable new features. These details promise to provide astronomers with a CAT-scan-like probe of the three-dimensional structure of shells of dust surrounding an aging star. Image: NASA and The Hubble Heritage Team (AURA/STScI). The light echo of V838 Monocerotis is a result of the light from the progenitor star illuminating and reflecting off the nearby clouds of dust and gas. The reflection of the light increases the length of the light’s path and as a result the light lags behind the starlight that travels directly to Earth. In effect, what appears to us as an expanding shell of ejected material is really light from the eruptions continually expanding outward. The surface of the light echo has an elliptical shape with the star at one focus and Earth at the other, and the echo’s expansion rate can’t be used to determine the distance to the V838 Mon system. While the Hubble images of V838 Monocerotis appear to show an expanding spherical shell of ejected material, they are really formed by the illumination of an ever-expanding ellipsoid. The light that travels directly from the star arrives to the observer first. If, however, the star is surrounded by clouds of dust and interstellar material, some light is reflected from the clouds and takes longer to arrive, effectively creating a sight of expanding rings of light around the star. The light is reflecting interstellar dust that is mostly behind the star as observed from Earth, not in front of it. The images taken since the initial eruption in 2002 show the dust around the star changing considerably. The dust itself, however, isn’t physically changing or growing. We just see some parts of it lit before others. The dust cloud itself is hardly moving at all. It likely existed before the outburst. The cause of the star’s outburst is still unknown. It was initially thought to be a standard nova eruption, but turned out to be something different entirely. The outburst caused the star to brighten to an absolute magnitude of -9.8. Theories suggest a merger of a binary star or planets and stellar death processes as possible reasons for the outburst. It is still unclear what it was exactly that caused the eruption and where V838 Monocerotis falls on the scale of stellar evolution as we know it. The companion star, a hot blue B-type main sequence star, is completely enveloped in the dust cloud. The brightening of V838 Monocerotis was initially thought to be a result of the rapid expansion of the star’s outer layers over a period of a couple of months, at an unusually high speed. It is, however, not yet clear if the nebulosity around the star is associated with the star itself, as it may have been produced in earlier outbursts. Some evidence suggests that V838 Monocerotis is a young star, still enveloped in the nebula in which it formed, and that the dust cloud illuminated by the outburst has been there long before the star erupted. Theories over the years proposed a variety of possible reasons for the outburst. 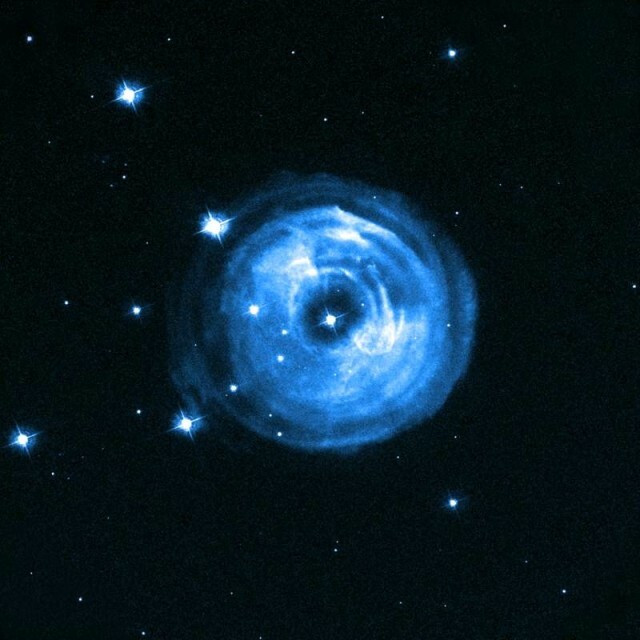 One suggested that V838 Monocerotis had an atypical nova outburst, which is unlikely because the white dwarf would not have had enough time to cool down and accumulate enough material from the companion. Another theory suggested that the light echo may really be shells of dust created by the star in previous eruptions and that the sudden brightening was a helium flash, which occurs when the star’s core ignites helium fusion which disrupts the star but doesn’t destroy it. However, most of the evidence indicates that the dust cloud around V838 Monocerotis is formed by interstellar material and not by the star’s eruption. There were several similar outbursts detected in recent decades. The red star M31-RV, located in the Andromeda Galaxy (M31) was observed erupting in 1998 and reaching an absolute magnitude of -9.95 before fading back into obscurity. Another similar outburst was observed in the Milky Way in 1994 when the star V4332 Sagittarii in Sagittarius constellation erupted. The star, also known as Sakurai’s Object, was a white dwarf that was ‘born again’ after undergoing a Very Late Thermal Pulse, which caused it to swell back into a red giant. 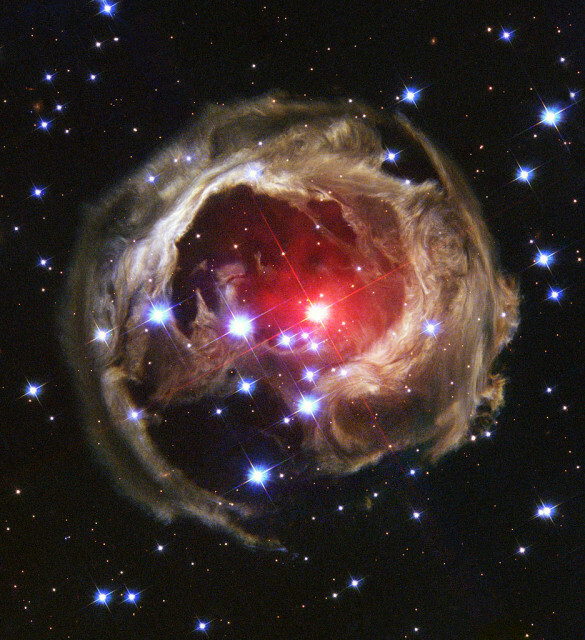 One of the theories explaining the outburst of V838 Monocerotis proposed that the event had occurred as a result of a merger of two main sequence stars. The merger theory is plausible and would also explain the multiple peaks in the light curve seen during the outburst. Computer simulations have also revealed that the inflated envelope would likely have come almost entirely from the smaller star in the binary system. A merger of two stars would result in a new, more massive star being formed, one that was unstable and could brighten dramatically and also redden and expand. V838 Monocerotis was discovered on January 6, 2002. Previously an unknown star, it was designated as a variable star, the 838th variable located in Monoceros constellation. At first the outburst from the star resembled that of a nova, which is why the star also got the designation Nova Monocerotis 2002. A nova eruption occurs when a white dwarf accumulates enough hydrogen on its surface from a close companion star. 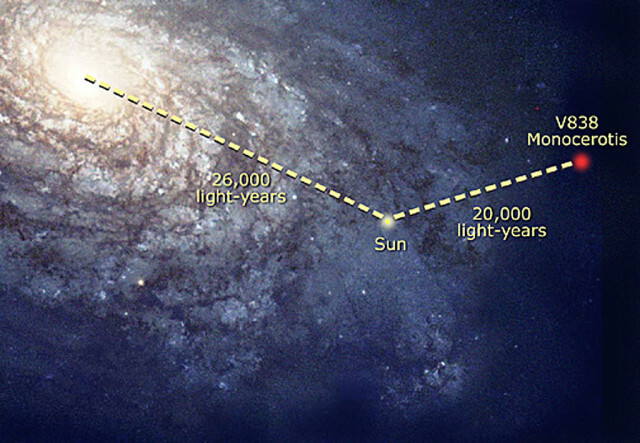 Location of V838 Mon in the Milky Way Galaxy. Image: NASA/ESA, A. Feild (STScI) and the Hubble Heritage Team (AURA/STScI). On February 6, 2002, the star reached the peak apparent magnitude of 6.75 and then started to grow faint rapidly. However, when it started brightening again in March and April, astronomers realised that the light curve resulting from the star’s eruption was unprecedented. After brightening in infrared wavelengths in March and April, V838 Monocerotis dimmed again and returned to near its original brightness before the outburst.